REUTERS/John KolesidisAnti-austerity protesters burn a European Union flag in Greece. 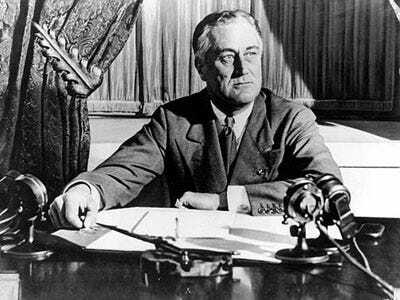 By the time President Roosevelt gave his inaugural address in March 1933, America was already in its fifth year of the Great Depression. 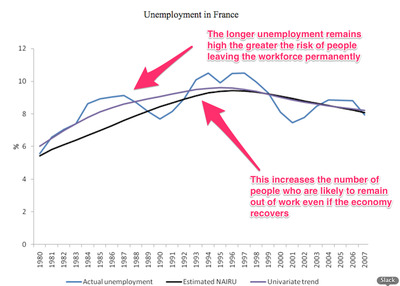 This national tragedy left more than one in five working age people unemployed. Industrial production in the US declined by almost half. And real GDP fell by almost a third. Contrast the US’s experience between 1929 and 1940 to that of the Eurozone since the onset of the financial crisis and Europe looks good by comparison. 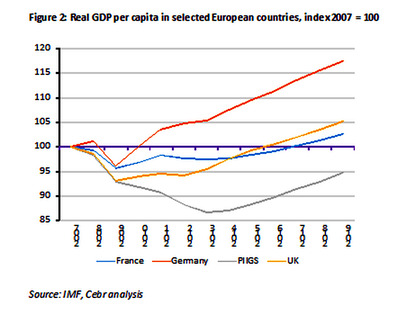 Europe’s real GDP declined only 5% peak-to-trough and unemployment peaked at 12%. Those figures, however, cover a multitude of sins. Greece has seen real GDP decline by 25% between the last quarter of 2007 and the last quarter of 2013, while youth unemployment in Italy and Portugal is still at shocking levels of 44% and 35% respectively. In both cases the crisis exacted a heavy toll on society with some of the poorest and most vulnerable the hardest hit. And in both opportunities to act decisively to address problems early were passed up and problems were allowed to fester. US unemployment rate between 1929-1940 and Euro Area unemployment between 2007-2013. ... That figure disguises the fact that some countries were hit worse than the US in the '30s, like Greece (27%) and Spain (24.4%). ... And sadly similar sights have become all too common in Southern European countries. 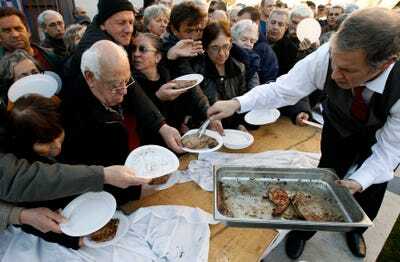 People are served free steaks at Athens' meat market, during the Tsiknopempti holiday in Athens. 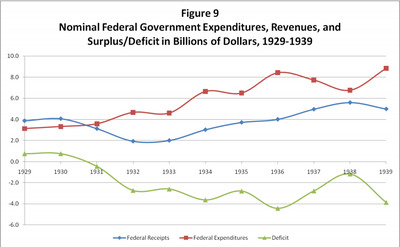 Now let's look at how the US Federal Reserve from the 1930s fared vs. the ECB of today. Federal Reserve (clockwise from top left) -- Roy A. 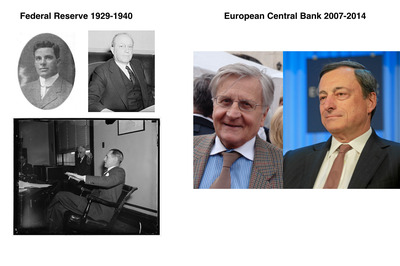 Young, Eugene Meyer, Marriner Eccles & European Central Bank (left to right) -- Jean-Claude Trichet, Mario Draghi. 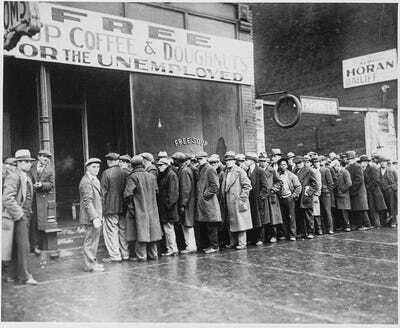 Critics say the Fed's response to the Great Depression was 'too little, too late.' 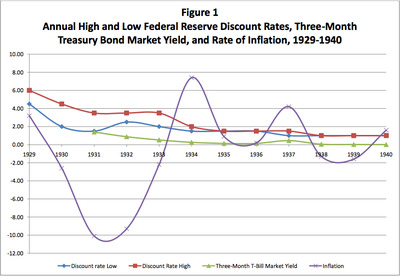 Look how the gradual discount rate cut failed to stop deflation. The Fed cut the discount rate in eleven steps from 6% in October 1929 to 1.5% in 1931. The Fed was handicapped by the gold standard, which prevented it from cutting interest rates deeply until 1933. 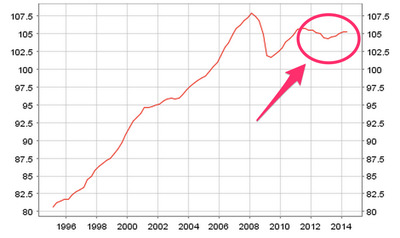 The ECB had a free hand, and it RAISED rates before the crisis was over. Team US (from left) -- Herbert Hoover, Franklin D. Roosevelt & Team Europe (clockwise from top left) -- Angela Merkel, Nicholas Sarkozy, Silvio Berlusconi, Brian Cowen, George Papandreou, José Zapatero. 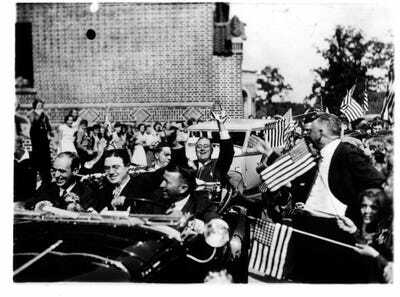 Under Roosevelt, the US got the New Deal, a bold stimulus package through the 'three Rs' of relief, recovery and reform. In the Eurozone, the region's economy is stagnating, investment has collapsed and a group of prominent Germans have filed a legal challenge to prevent ECB chief Mario Draghi delivering on his promise to do 'whatever it takes' to save the euro. And here are the results. It took 10 years from the start of Great Depression for the US to recapture its pre-crisis level of output. 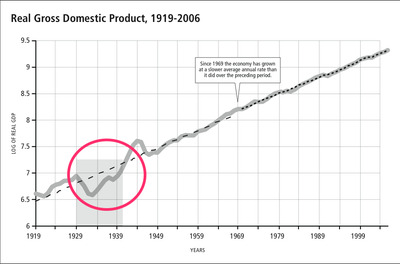 US real GDP between 1919-2006. 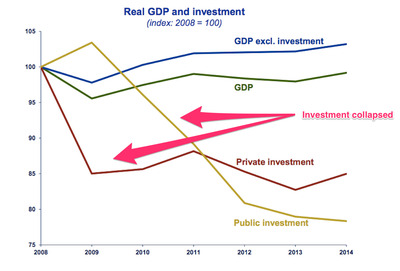 But the Euro Area's real GDP still remains 3% below its pre-crisis level almost seven years later. 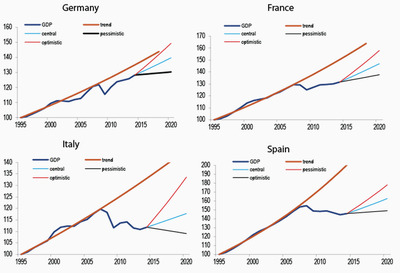 And the PIIGS (Portugal, Italy, Ireland, Greece and Spain) are not forecast to recapture their pre-crisis level of output even by 2019. 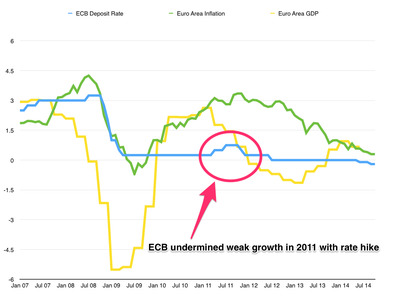 Signs of that damage are already apparent in Eurozone data. GDP forecasts for major economies are already below the trend. Permanent damage could be a huge problem as Europe's population is both older than the US's, and it has a shrinking workforce which the US did not have between 1920-1940. 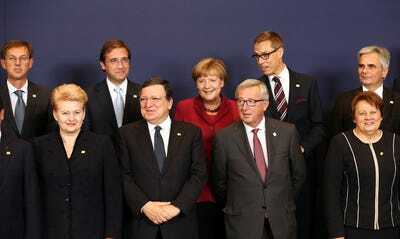 Yet seven years from the start of the crisis Europe is more divided than it has been in decades. 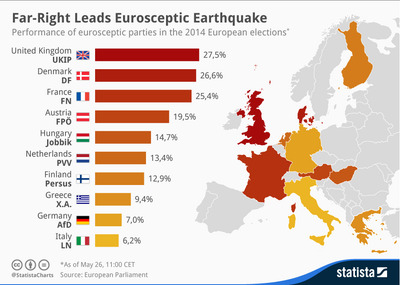 Right-wing eurosceptic parties are gaining strength across the region casting doubt over the future of the economic bloc. The question now is whether European leaders can unite to reinvigorate the Euro project and pull the region out of its slump, or allow its current fractures to break it apart.